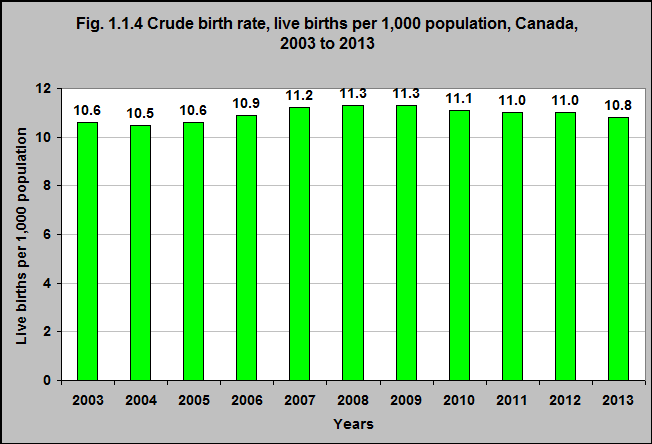 Source: CICH graphic created using data from Statistics Canada, Table 102-4505 – Crude birth rate, age-specific and total fertility rates (live births), Canada, provinces and territories, annual (rate). http://www5.statcan.gc.ca/cansim/a26?lang=eng&retrLang=eng&id=1024505&&pattern=&stByVal=1&p1=1&p2=38&tabMode=dataTable&csid= -accessed March 15, 2017. In 2013 the crude birth rate, or the number of live births per 1,000 population, was 10.8. The crude birth rate rose between 2006 and 2009, but then began to fall again with the 2013 crude birth rate being similar to 2006.